J. Frank Kinsel, Jr. came to Cantey Hanger from a large law firm in Waco, in 1990. He practiced in Dallas for a period before that. As the son of an attorney for Texaco, Inc., Jeff lived in New York, South America and Belgium as a child. When younger, Mr. Kinsel’s first legal experience was as an oil and gas contract attorney for a Texas oil drilling company. In that capacity he lived, worked and traveled extensively in the Middle East negotiating contracts. 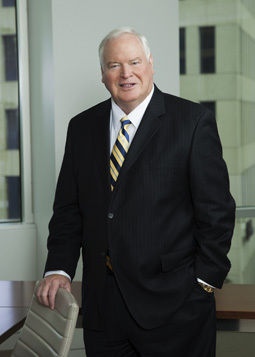 He later evolved into an insurance litigation lawyer with clients such as medical care providers, bus companies, ambulance companies and manufacturers. Mr. Kinsel handles cases involving first party insurance coverage, employment litigation, medical malpractice, product liability, bad faith and legal malpractice. He has expertise in personal injury litigation including product liability, premises liability, toxic torts and environmental matters.